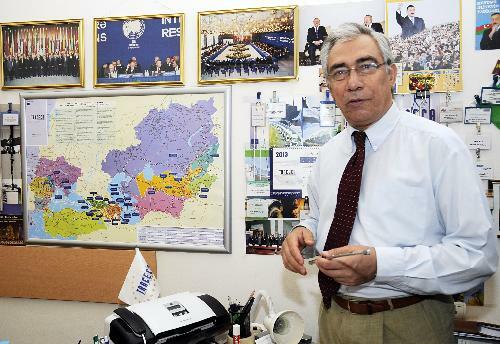 The North-South and East-West (TRACECA) transport corridors will complement each other, believes Akif Mustafayev. The East-West project links the Far East countries - China, Japan, Korea with Europe, but the North-South project will connect the Scandinavian countries to the Persian Gulf, due to which these two projects will not compete, the TRACECA National Secretary in Azerbaijan told Trend on April7. Azerbaijan enjoys a strategic location on the intersection of these two major transport projects linking north with south and east with west, and its geographic location is expected to pave the way for Azerbaijan to become a transport hub in the region. "Cargoes, which come from China, can be directed to Northern Europe, and the goods from Western Europe - to Iran, that is, the North-South and East-West corridors actually combine. In this case, Azerbaijan will become a hub, a logistics center of transit cargo transportation," Mustafayev said. Cargoes from all directions are expected to enter the free trade zone to be established in the Alat settlement near Baku, where an international commercial port is located. The TRACECA program was established at the Brussels conference on 3 May 1993 which was attended by the ministers of transport and trade of eight states -- Kazakhstan, Kyrgyzstan, Tajikistan, Turkmenistan, Uzbekistan, Azerbaijan, Georgia and Armenia. The Europe-Caucasus-Asia Transport Corridor (TRACECA) is involved in gradually developing trends of trade and economic development. Major traffic flows passing through a corridor formed on the one hand, in Western and Central Europe, and on the other - in Central and South-East Asia. The North-South corridor, from India to Helsinki, with a length of 5,000 kilometers is designed to carry more than 20 million tons per year. It is a multimodal route for transportation of passengers and cargo from Russia's St. Petersburg to the Mumbai port. It is designed to carry transit cargo from India, Iran and other Persian Gulf countries to the territory of Russia (the Caspian Sea) and further - to Northern and Western Europe. Experts believe that the North-South route enjoys several advantages compared to other transport corridors; it is more profitable for each parameter than other alternative routes, such as the Suez Canal-the Mediterranean Sea-Northern Europe and the Turkmenistan-Kazakhstan-Russia-Northern Europe routes. The preliminary estimates show that at an initial stage, it is planned to transport 6 million tons of cargo via the North-South corridor a year, and 15 to 20 million tons of cargo in the future. Leonid Gusev, a senior research fellow at the Analytical Center of the International Studies Institute at the Moscow State Institute of International Relations, believes that this project has good prospects to be realized. "The North-South project has been developed for quite a long time and its implementation could significantly reduce the time of delivery of goods," Russian expert told Trend. Gusev noted that the international sanctions imposed on Iran were previously creating difficulties for the implementation of the project. However, currently, the project has good prospects for development. "This project requires significant amount of investments," he noted. "It is necessary to thoroughly study the issue and if it is solved, the project will be possible to be realized soon." On April 7, Baku hosted the first trilateral meeting of foreign ministers of Azerbaijan, Russia and Iran, Elmar Mammadyarov, Sergey Lavrov and Mohammad Javad Zarif, where the sides discussed cooperation in implementation of bilateral and trilateral projects, including the North-South transport corridor. The sides agreed on the joint work of transportation ministries, customs and consular services to advance the transportation projects. The sides also agreed that the relevant ministries of these countries will comprehensively review the implementation of the North-South transport corridor project. Alexander Savchenko, the director of the Russia-based Centre for Situational Monitoring and Regional Studies, believes that joining this project is beneficial for Moscow as it will allow Russia to strengthen economic ties with a number of states in its south. "For Russia, this project can be beneficial in terms of transit, as well as in terms of infrastructure development and strengthening economic ties," he told Trend . "The project will facilitate the transportation cooperation with Iran and beyond. Potentially, it becomes possible to facilitate cooperation with India." Will Caspian Sea-Black Sea route become competitor of BTK?